The newest ARC plug-in window looks just like all ARC 2.x versions. This view shows the calibration for my studio using Equator Audio D5s and a KRK 10S subwoofer. ARC works fine with nearfield monitors, full-range and subwoofer arrangements, and can be switched instantly between different monitor setups. A new microphone technology is helping IK Multimedia’s ARC provide ever-better correction for uneven room acoustics. IK Multimedia have been developing audio software and hardware for almost two decades, and it’s now 10 years since they introduced their software-based room-correction system. 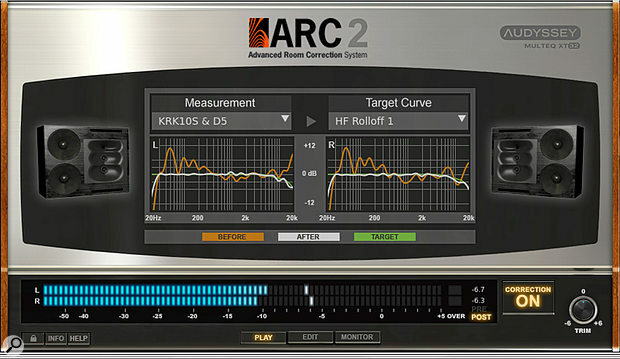 Advanced Room Correction, or ARC, shipped with a dedicated omni measurement mic and allowed users to measure the frequency response of their monitoring system and apply corrective EQ in a plug-in. 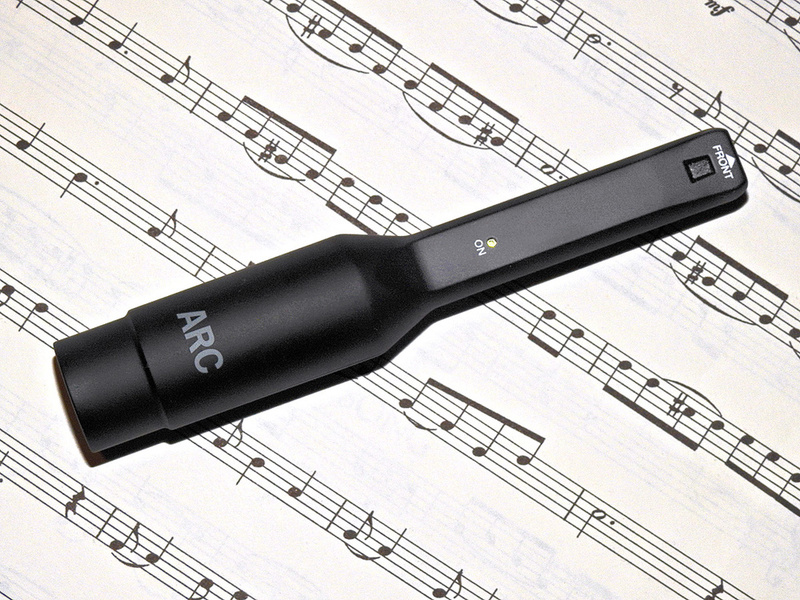 In 2013, ARC 2 was released with added features, better measurement resolution and a new, improved microphone, though users were given the choice of using an older mic if they had one. Although the mics were ‘tailored’ for the ARC application, being capacitor mics they were subject to unit-to-unit variation and drift in frequency response over time. Which brings us to ARC 2.5. The new software is a free upgrade for ARC 2.x owners — you can just go to your account at IK Multimedia and download it — but the headline news is the provision of a different microphone. Whereas the mics supplied with v1 and v2 were conventional capacitor mics, the new model uses MEMS technology (see box). This is said to offer improved consistency, for better results across the audio spectrum. The new v2.5 software is still compatible with the previous mics, though. Paul White covered ARC 2 shortly after its release in SOS October 2013, so I won’t repeat his basic description, his comments on treating small rooms, or the fact that he found ARC 2 to do exactly as claimed. I will describe new features and show what the measurement software does. The measurement utility is now available only as a 64-bit program, and the process involves five steps. Tests have to be made with an ASIO- or Core Audio-compatible interface using a 48kHz sample rate, and the tones involved can be quite loud, so it’s advisable to use ear protection. ARC 2.5, like previous 2.x versions, requires at least seven measurements, and can use up to 16. These are made on the centre line between your monitors, at ear height, and symmetrically left and right of the centre line at various distances around the optimum engineer’s position. Making the measurements is a somewhat tedious process, since the accuracy of the mic placement affects the results. While the previous two versions of mics were used in a vertical orientation, pointing toward the ceiling, the MEMS mic is used horizontally, pointing forward parallel to the center line between speakers and the engineer’s position. The height and ‘X/Y’ positions are somewhat critical, so a mic stand is essential, and the more you can do to ensure that the positions are accurate and repeatable, the better. I made a reusable floor mat, marking locations along the centre line and symmetrically off to the sides, and hung a small fishing weight on a thread exactly below the mic capsule, so I could accurately position the mic. The measurement process uses a fast sine sweep that runs from about 20Hz to 22.5kHz. After measurements are made, the resulting calibration data can be loaded into the ARC 2.5 plug-in in your DAW. This is available in Audio Units, VST 2, RTAS and AAX formats for PC and Mac, in both 32-bit and 64-bit versions. The new version of the plug-in looks identical to the previous 2.x versions, is still labelled ARC 2, and loads room correction files made with earlier software and mic versions, so I’m not sure how different it is from the previous version. As with the earlier versions, ARC 2.5 can significantly improve a moderately good room and make a well-controlled room sound amazing. Of course, as Paul indicated in his review, and Paul and Hugh seem to do on almost every Studio SOS visit, you should first clean up the acoustics in your room with at least a minimum of absorbers, bass traps and diffusion. An untreated room may exhibit dips and peaks that exceed 20dB! As you can see in the screenshot, the worst peak in my treated room was +10dB at 50Hz (orange curve), and there were several other peaks and dips in the 3 to 6 dB range. After correction, the room appears flat at the listening position within about 1dB from 30Hz to 20kHz (white line), except that I intentionally use one of ARC’s Target Curves to roll off the highs. Target Curves are a useful feature, and not only enable you to tailor the response to suit your tastes, but also provide a Virtual Monitoring section that allows you to hear your mix as it might sound on lower-fidelity devices such as an LCD TV, a car audio system, a small radio, and so on. The improvement in clarity, especially in the lower few octaves, impressed me four years ago when I first tried ARC 2, and the newest incarnation with the MEMS mic continues to impress me. In short, the new version of ARC works as claimed, and the new MEMS mic provides an extremely flat response when used with ARC 2.5 (see ARC 'MEMS' Mic box). If you already use ARC 2.x, and are happy with your results, version 2.5 may not blow you away, but it could provide somewhat better results; the software upgrade is free and the price of the MEMS mic is very reasonable. If you do not yet use ARC, the price of the software and mic is still reasonable for the significant improvement they can offer. It’s no substitute for good room treatment, but in small rooms in particular, there’s often a limit to what can be achieved, especially in the lower few octaves, and the ARC system will yield a significant improvement to almost any room. Obvious rivals to the ARC system include Sonarworks Reference, which has the unique selling point of also correcting headphone frequency response anomalies, and the KRK Ergo system, which has its own hardware monitor controller and processor. Numerous loudspeaker manufacturers now make monitors with inbuilt DSP that can compensate for room issues. The new ARC 2.5 MEMS mic is smaller and lighter than previous ARC mics, but more rugged and flat to ±0.5dB when used within ARC. Micro-electromechanical systems (MEMS) have been used in a vast variety of applications. First employed in inkjet printers, they have since found roles in accelerometers in automobiles for airbag deployment and pressure sensors in tyres, and MEMS gyroscopes are used in consumer electronics devices such as tablets, phones and game controllers. The potential of using the technology to create microphones was demonstrated in the early ’90s, but the first commercial MEMS mics were introduced in 2002. Since then, they have been used by the billions in phones, tablets and laptops — one company alone claims to have shipped 10 billion MEMS mics! As yet, MEMS technology has not been used in any studio-grade microphones, partly because existing MEMS mics exhibit relatively poor signal-to-noise ratio, but that may change in the next few years with new MEMS technologies being developed to provide even better stability and higher SNR. Why is a MEMS mic more consistent than a capacitor mic? Conventional capacitor mics use a thin plastic membrane coated with an extremely thin layer of a conductive material such as gold, stretched over a frame positioned close to a metal backplate. Any variation in the thickness or tension of this diaphragm can cause distortion and fluctuations in frequency response. Since these assemblies are partially handbuilt, there is bound to be some variation from unit to unit. Furthermore, over time, with temperature and humidity, the membrane can weaken and distort, significantly affecting the mic performance. MEMS mics, by contrast, are fabricated on silicon wafers using semiconductor etching and metal-depositing processes that are highly automated. There are currently two kinds of MEMS mics: capacitive and peizoelectric. The new ARC 2.5 mic is a capacitive design, which works on the same principle as a capacitor mic, but has been shrunk to microcircuit size — the typical MEMS diaphragm is about 1mm in diameter. Like a traditional capacitor mic, capacitive MEMS mics have a movable membrane and a fixed backplate over a cavity in the base wafer, but these structures are extremely precise and repeatable from unit to unit, and silicon is far more stable over time and in response to environmental stresses than the Mylar that is typically used for standard capacitor mics. The newer piezoelectric designs, by contrast, make use of the piezoelectric effect that causes some materials to generate a voltage in response to pressure variations such as sound waves. This design eliminates the need for a closed air gap, and can potentially yield better signal-to-noise ratio, but is still an emerging technology. So, although the IK Multimedia MEMS mic is not as handsome or rugged-looking as its predecessors, it is actually more rugged and stable. The older IK00008 is a chrome/steel affair that weighs 148 grams, while the new MEMS mic is made of black plastic and weighs a mere 25 grams. The expected advantages of unit-to-unit consistency and stability over time and over exposure to temperature and humidity should be a great advantage for its intended use, while the mic’s limited signal-to-noise ratio is not an issue in this application. I found the frequency response of the MEMS mic to be flatter from 1 to 20 kHz than that of any capacitor mic I checked against it, but, likely due to its very small effective diaphragm, the low end rolls off below 60Hz more than the previous IK Mulitmedia mics or the studio mics I tested. But, of course, the ARC 2.5 software ‘knows’ this and takes it into account, with the frequency response when used within ARC specified as 20Hz to 20kHz, ±0.5dB. IK also specify signal-to-noise ratio at 65dB (A-weighted) and list a maximum SPL of 124dB, albeit with no distortion level listed. The MEMS mic requires phantom power from 12 to 48 V, and can be used without the ARC software as a general-purpose omni mic. Version 2.5 software is free to anyone with version 2.x and works with either previous ARC mic. New MEMS mic is reasonably priced, can be used for other studio recording activities, and provides very precise measurements when used with ARC 2.5. Virtual monitoring mode can be useful to audition mixes as they might sound on boomboxes and other modest sound systems. Measurement process requires accurate placement of mic in all three dimensions for good results. IK’s room correction system continues to evolve, and can effectively ‘clean up’ the sound of any room, though best results are always obtained from a combination of a treated room and ARC correction. €239.99; software upgrade from v1 €59.99; MEMS microphone €83.99. Prices include VAT. $199.99; software upgrade from v1 $49.99; MEMS microphone $69.99.